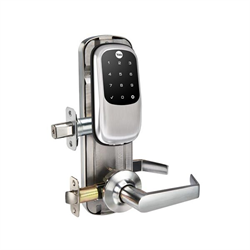 The Yale YRC246-ZW2-619 Z-Wave keyless touchscreen single point lock’s highly versatile nature makes it an excellent choice for both residential and commercial applications. Its modern high-tech look and feel adds aesthetically to any living space as well as increasing the value of your residence. Its DIY nature means it can be installed in minutes with just a screwdriver. Voice assisted programming aids in creating a smooth installation process. Keyless, the lock can store up to 25 pin codes and when connected to a Z-Wave system, can be expanded to hold up to 250. The sleek touchscreen features backlit numbers for ease of reading in the dark. Don’t worry ever again about fumbling for keys in the middle of the night and simply enter your pin to unlock the door. Using the Yale Accentra Cloud-Based software, you can manage access for residents, guests or staff with ease from anywhere using a compatible Windows, Apple or Android device. Distribute one-time pins to visitors and grant new ones in the event of a relative forgetting theirs. You’ll never have to worry again about anyone being locked out. Battery powered, it comes with an additional backup battery as well as a low battery indicator to keep you informed. Lever not included and required to be purchased separately.